One of my 4 machines immediately offered to upgrade to Windows 10. The rest are just sitting there, probably because Microsoft is stacking up upgrades over weeks or months. It's simple to force an update. Download it (it's 18Meg), and run it. Select "Upgrade this PC now". It downloads the multiple Gigs of Win10, then installs. Near the end of installation, there will be a screen "Get Going Fast" with the default button "Use Express Settings". Instead click the small link "Customise settings" (it's "Customize" in US versions, "Customise" in UK). On "Customise Settings" first page, turn off "use page prediction" (2nd option), and at least the first 2 "Connectivity" options below that (automatically connect to open hotspots, networks shared by contacts). "Smartscreen" and "Send error and diagnostic information" are acceptable. On "Customise Settings" second page ("Personalisation" and "Location"), turn off all of them. If you use a local account, it will show "Make it yours" which will convert you to a Microsoft (hotmail/outlook.com) account. Click the small link at the bottom "Skip this step". You can change the Browser, Music, Photo and other defaults here. Chrome and Firefox will both complain they are no longer default browser- Windows 10 will open the default apps page for you. If you accidentally switched to a Microsoft account, Accounts > Your account > "Sign in with a local account instead". In Privacy, fix the options under "General", "Location", and "Speech, inking and typing". In Network & Internet > Wi-Fi > Manage Wi-Fi Settings > "Wi-Fi Sense" turn off both options (Connect to open hotspots, connect to networks shared by contacts). 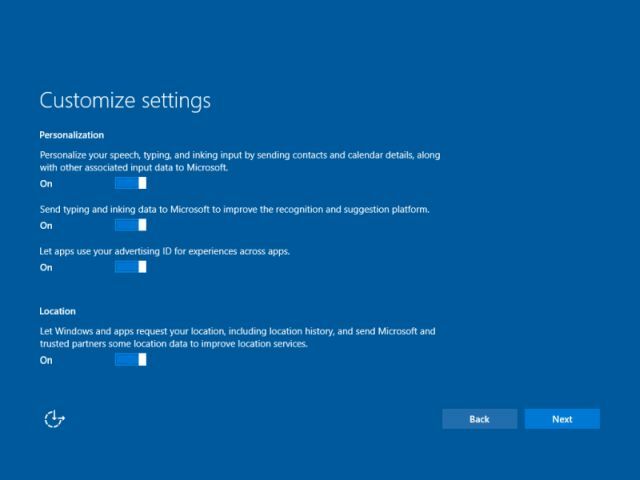 In Update & Security > Windows Update > Advanced Options > Choose how updates are delivered > make sure you don't use "PCs on my local network, and PCs on the internet" (the "PCs on my local network" should be okay on a home network).